So I have found a glider that I am wanting to adopt but the cage it is in is pretty small. When I used to come to this site I saw people building pvc cages. 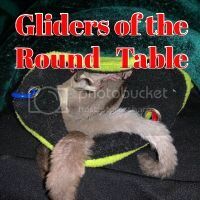 Is this still safe for gliders? If so what type of netting did you use? Any tips? Here is a link to build one. There are other "How To" pages you may find if you search around for them. But that one above looks pretty descriptive. If you have any additional questions, me and Cora have experience with home-made cages.